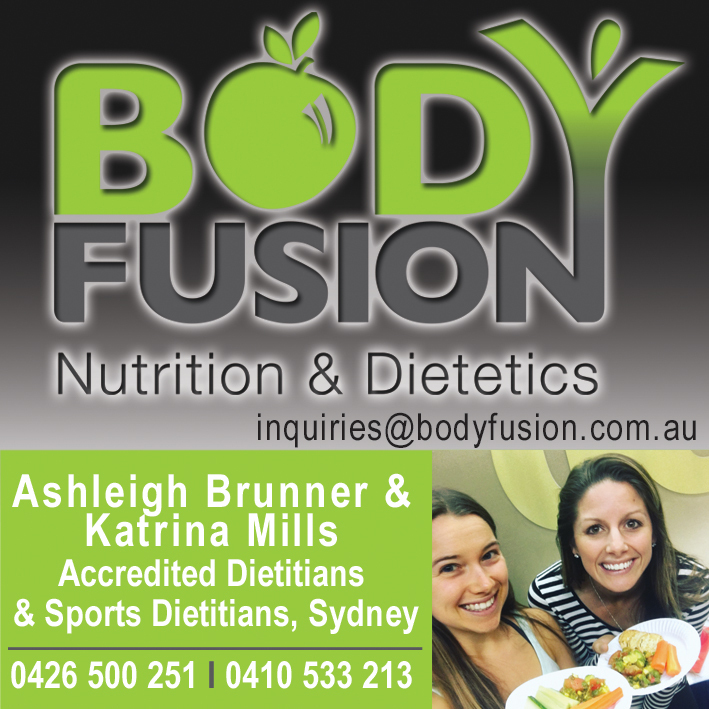 Body Fusion is a private practice Dietetics business with experienced Accredited Dietitians and Sports Dietitians. Body Fusion has five locations in Sydney: Balgowlah, Rozelle, Cremorne, Lane Cove and Kirrawee and presents engaging workshops to many dance schools across Sydney to optimise performance. These include not only education around fuelling and recovery for dance but also include micronutrient needs for dancers (calcium and iron), immunity, hydration, best brand selection and tips of Eisteddfod nutrition. Owner Ashleigh Brunner - B.Sci (Nutrition) (Hons), B.App.Sci (Exercise and Sports Science) - is an experienced Dietitian who specialises in a wide spectrum of diet related issues for all ages, from children through to adults. Ashleigh is a Sports Dietitian who has also taught students at the Australian Institute of Fitness and Australian College of Physical Education. Ashleigh's valuable team members Aimee Boidin and Melissa Meier are Accredited Practising Dietitians & Nutritionists who help clients realise their health goals through nutrition, assisting to improve their relationship with food. Body Fusion has five clinic locations in Sydney - the main office in Lane Cove, plus clinics in Rozelle, Kirrawee, Cremorne and Balgowlah. However we do Skype country wide within Australia including Melbourne, Canberra, Adelaide, Perth, Darwin, Hobart and Brisbane.